Decorated by illustrators, graffiti artists, printmakers and graphic designers visitors are being encouraged to follow the feathered trail and enjoy beautiful open spaces, inspiring buildings and Birmingham’s cultural heritage along the way. Help is on hand with the free ‘The Big Hoot’ app which you can use to keep track of the owls and unlock rewards. 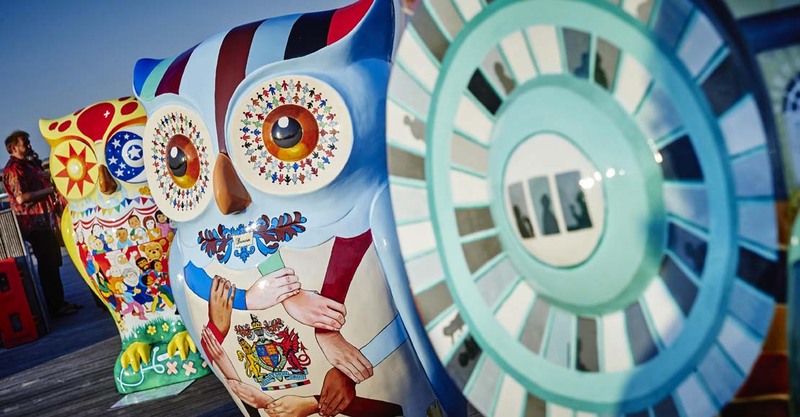 Each of the unique sculptures has been given its own style and character by the artists and includes cartoon owls, night owls, wise owls, and celebrity owls to owls that celebrate Birmingham’s landmark architecture, history, people, places and cultural diversity. At the end of the trail the owls will be auctioned on Thursday 15 October to raise money for Birmingham Children’s Hospital. You can also support the hospital by texting HOOT to 70099 to donate £2. Visit The Owltlet in Great Western Arcade to get your hands on a wide range of Big Hoot merchandise, buy your own mini owl or pick up a map. This entry was posted in Art, Birmingham and tagged Art, Birmingham, The Big Hoot. Bookmark the permalink.